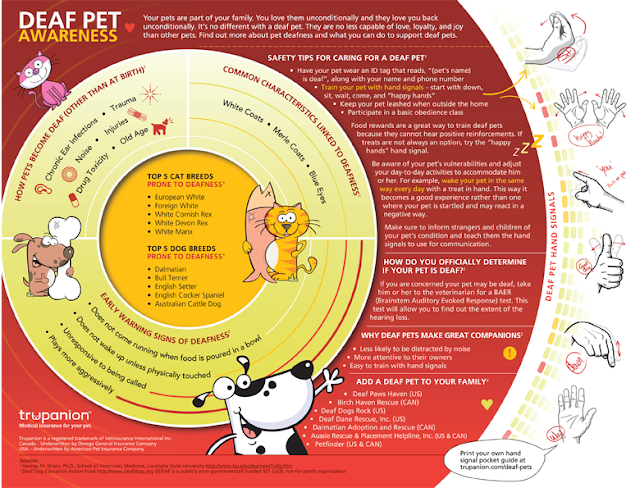 Since last week was Deaf Pet Awareness week, we decided to move our post on avocados to next Monday, and share this infographic from Trupanion Insurance with you instead. Of course, we might be a tad bit prejudiced because of Maxwell...but we found it fascinating. Thanks to Trupanion Insurance and visual.ly for the infographic! We did find it interesting that they didn't include instructions on how to teach your pet the word "no," (gee, we wonder why...*snicker*) so here's a short youtube video that shows you how. What a great post. Thanks fur sharing! Have a pawsome Monday, furriends. Me: Sitting here like a total idiot clicking two fingers down on my thumb and shaking my head!! Austin: "Are you doing the St Vitus Dance?" I was thinking the same thing - why does there need to be a "no" hand signal? Just something to give deaf kitties the pleasure of ignoring, I guess! What is this "no"of which you speak? We do not know what that is around here. MOL! Seriously, it was a great post, friends. Thank you for sharing it with us! Great post! Our mom is going to adopt a special needs kitty next time. We'll see what happens at the time, but maybe a blind or deaf kitty.